In just a couple of weeks I will be at my fifth Rollercon! Modern Roller Derby has re-inspired me. My generation of Roller Derby started a half century ago, and yet these people have made me feel such a part of what is going on today and the history of where the game came from. In August Roller Derby will be 77 years old; and yet it is the most modern and fastest growing sport in the world! And Judi Flowers and I will be part of the GoMerch/Seltzer Brand booth at Rollercon (#61…..right across from Wicked Skatewear…..didn’t I teach you to promote all the time?). Go Merch is one of the leading fanwear vendors in the industry and is exclusive to many of the artists (Train and others) and record labels, and we are proud to be part of their entry into “our” world. And Judi, of course, is Seltzer Brand. And our friend Doug Martin of Roll Models at completeteamoutfitters.com who is proving to be among the best of uniform distributors will also have a display in booth 61. 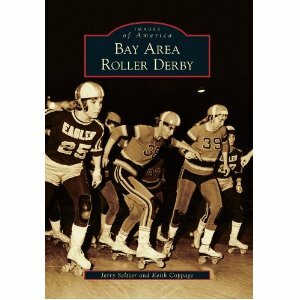 And of course I will be autographing “Roller Derby to Rollerjam” for you and hopefully in pictures with you and for the first time showing the new book by Keith Coppock and me “Bay Area Roller Derby”, a part of the Image of America series by the prestigious Arcadia Publishing company. It starts with Roller Derby in the thirties and takes it right up to modern Derby, with plenty of previously unpublished photos and stories. Is that enough of Seltzer at Rollercon? Well there is much more: I will be heading a seminar at 4 PM on Saturday with Val Capone and your help on making your league more successful from a marketing point of view! And I will be hanging with one of Derby’s amazing groups: Derby over 40. There are now over 1200 members, some in their sixties! There will be a gathering at 10 PM on Thursday, and a game of all over 40’s at 2 PM on Saturday (yes, you will have time to make to the seminar!). And Saturday night I will be taking a new Derby wife: Lori Milkeris who has been such an inspiration to all in Derby (and without) with her fight back from an abusive relationship that almost killed her (see I Like Women on my blog) and has helped lead to the creation of Derby Against Domestic Violence and Blockers not Bullies on facebook and many of the leagues working with women’s shelters and other organizations. By the way, Lori will be at our booth during the event and I hope as many of you as possible will stop by and say hello! And then the pants off dance off and all the other parties…..and I want you all to meet Dan Cooper of Go Merch and of course Judi Flowers and Jim Weymouth of Seltzer Brand! For you first timers at Rollercon, you will skate your asses off, learn your asses off, party your asses of and realize what a connected world Derby is! If I had drawn the scenario, I wouldn’t have it any other way. wow, just saw the statistic that my blog has had over 170,000 of you reading it since I started! Sorry this will be my first Roller Con I shall miiss. Please give my best to all the skaters from Little Iodine. Love to Trish & Ivanna. All the groups did so great last yr.
Loretta will be missed but never forgotten!